With a Dossier Deliver account, you can upload confidential letters to online application systems. In some cases, an online application system will ask for your letter writer's contact information so they can email a link your writer can use to upload a letter to the website. 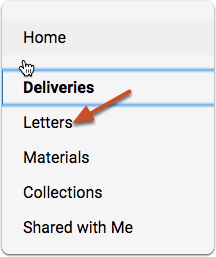 If this is a requirement, you can input an Interfolio-generated "document email address" in place of your letter writers email. 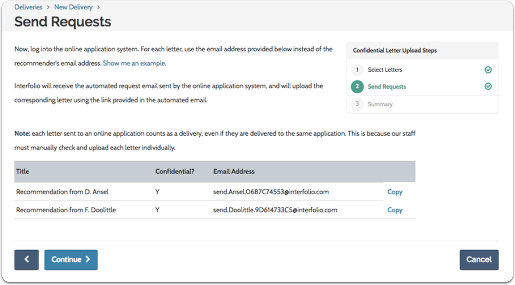 This will allow Interfolio to upload the letter directly to the application without bothering your letter writer. Other online application systems provide you with a link (URL) to give your letter writer to a website where your recommender can upload a letter of recommendation. We refer to these types of deliveries as "Confidential Letter Uploads." This article will show you how to upload confidential letters to an online application system. 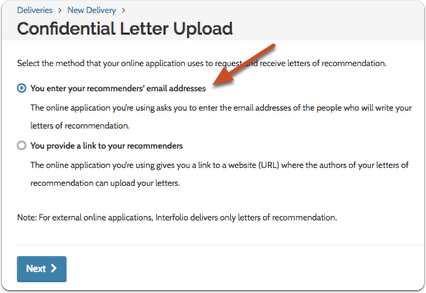 Remember, that in order to upload a letter to an online application system, you must first have the letter in your Dossier account. 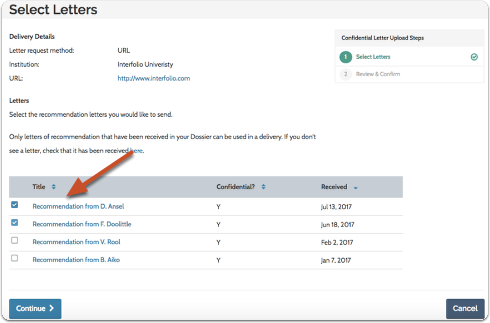 See here for more information on requesting a confidential letter of recommendation through Interfolio. Interfolio has a 1-3 day turnaround time from the point we receive the request to upload your letter. 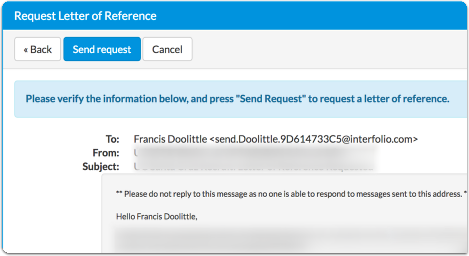 If an institution asks for information during the confidential letter upload process, the interfolio agent will enter Interfolio's contact information. 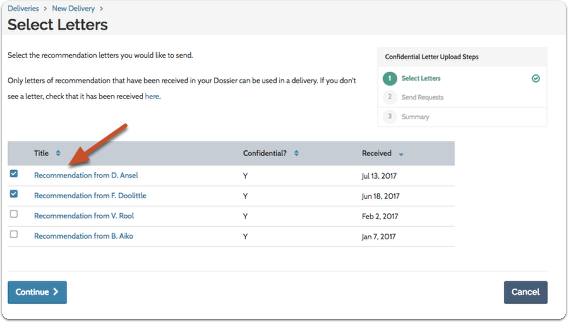 For confidential letter uploads, we can only send letters of recommendation that are in your Dossier account. These are letter you have already requested, and that have been uploaded to your Dossier. 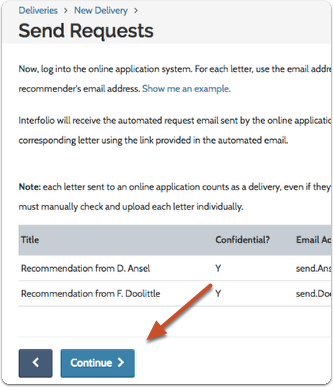 If you have not already requested a letter through Interfolio, you will need to follow these directions on how to request a confidential letter of recommendation through Interfolio. Only letters with the status "Complete" can be uploaded to an online application system. When your recommendation comes in it will appear in your Dossier and you can continue with the instructions below. 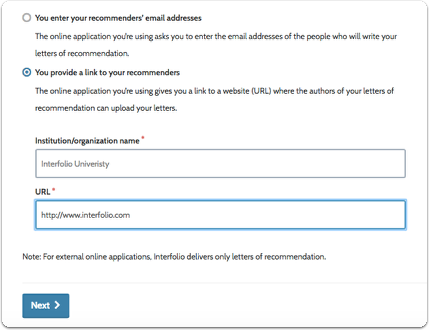 See here if you need detailed instructions on how to request letters of recommendation through your Interfolio account. 4. Click "Confidential Letter Upload"
5. 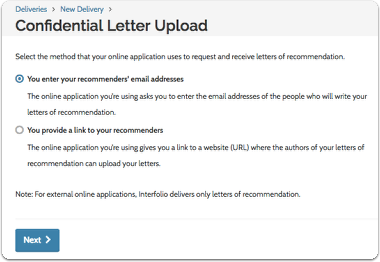 Select the method that your online application uses to request and receive letters of recommendation, and click "Next"
Some online systems require you to enter the email addresses of the people who will write your letters, and some provide a link to a website where your letter writers can upload letters of recommendation. Remember, you can only upload letters that have already been added to your Dossier. 1. Select "You enter your recommenders' email addresses and click "Next"
2. 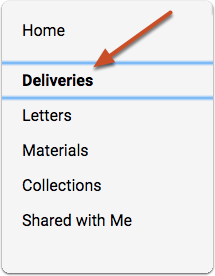 Select the letter(s) you want to send and click "Continue"
7. 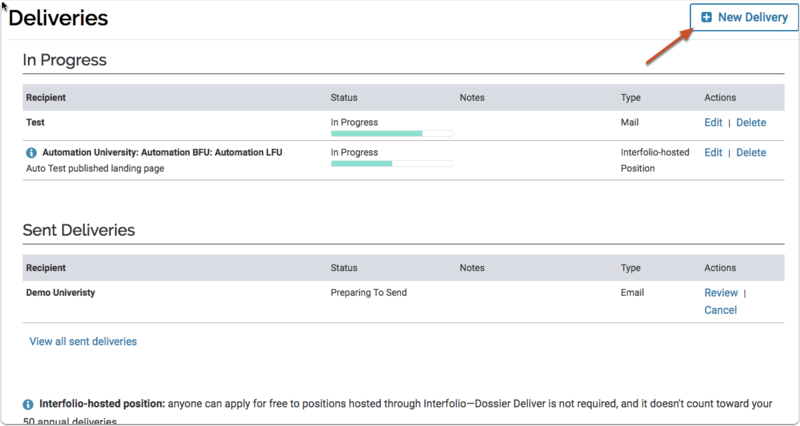 Back in Dossier, click "Continue"
Once we receive the request, we will upload the letter from your Dossier to the online application system. Depending on the system, it may take Interfolio a day or more to receive the request. Some systems require the uploader to answer additional questions in order to upload a letter. We will leave those questions empty or select "N/A" when possible. However, if the questions are required and we cannot answer them, we will cancel the request and notify you. Follow the instructions below, and we will upload the letter you want to send to the URL you were provided. 1. Select "You provide a link to your recommenders"
2. Enter the name of the organization and the URL you were given, and click "Next"
3. 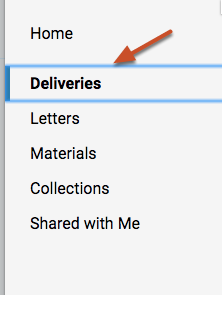 Select the letters you want to send, and click "Continue"
4. Review, Confirm, and click "Submit Delivery"
Why hasn't my online application delivery been created yet? Please monitor your pending deliveries closely and let us know if you're expecting a delivery that hasn't come in yet. 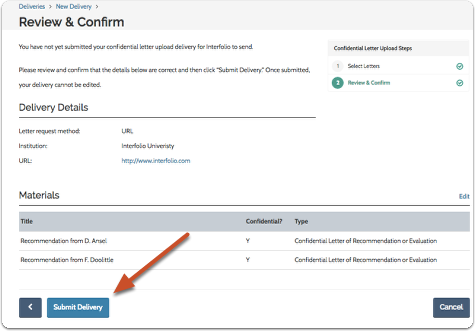 If your online application delivery was canceled and you have resolved the issue (purchased more delivery credits, reactivated your account, etc) than you can resubmit the letter from your deliveries screen. 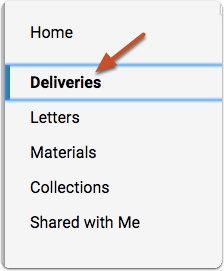 From the dashboard, select the deliveries button.